The hubby has a craft! The last few times we've been down to Hobby Craft he has been gazing longingly at the Quilling sets. (wanna know what quilling is??) To be honest - and I've said this to him - I really didn't think he would have the patience for quilling but he's kept on coming back to it saying he's really really like to give it a a go. So I bought him a beginners set (at a rip off price of over £30, only to find it for £20 on ebay after, grrrrr), and I have been prooved wrong! 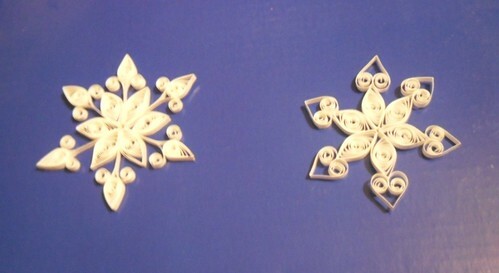 Have a look at these lovely, delicate, detailed snowflakes! He used up all his white paper within the first few days so I ordered him 4 packs of papers as a treat, and some dried lavender for myself. Thanks to the bank holiday we only got them today and we've been hopping up and down since I placed the order. Typical that his would come on the day he's off out for the evening, but for me that means I can get the sewing machine out without the vibrations knocking his hands. In fact, since I have got the kids fed, washed and tucked into bed... I think I'll make a start!